**PLEASE NOTE: this is NOT YOM eligible as the plate number is in use on a newer commercial vehicle. Black California motorcycle license plate, 8" by 5" with some scratches and spots of surface rust, that would be great for a plate collector, but NOT NOT NOT for use on your motorcycle. Please click on image to see a larger picture. California SE plate, 124255, oversize blue plate at 8" by 5" with some scratches, that would be great for a plate collector. Please click on image to see a larger picture. Here is a nice metal license plate frame which will fit 7" by 4" license plates (holes are 5-3/4" and 2-3/4" apart). The frame is silver in color, and the eagle is a gold color. 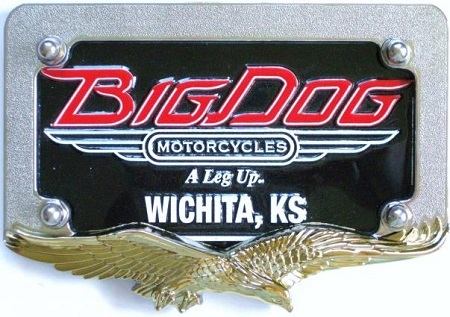 Big Dog plate and hardware also included. Please click on image to see a larger picture. Price is for one frame. Here is a nice metal license plate frame which will fit 7" by 4" license plates (holes are 5-3/4" and 2-3/4" apart). The frame and eagle are gold in color. 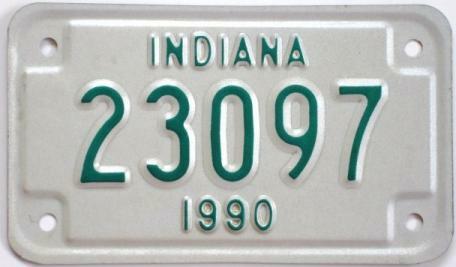 Indiana plate and hardware also included. Price is for one frame. Honda motorcycle frame, Culver City. This will fit a 1970's blue 7" by 4" or newer white California plate (holes are 5-3/4" and 2-3/4" apart), but will NOT fit the older, larger, black plates. This is a used frame with some scratches and pitting. Nice item from the Black Hills Motor Classic in Sturgis, South Dakota in 1995. Please click on the image to see larger picture. This measures 7" by 4-1/2". Harley-Davidson novelty license plate, 12" by 6", flat (non-embossed), flexible metal, licensed, purchased several years ago. Please click on the image to see larger picture. Harley-Davidson motorcycles novelty license plate, 12" by 6", flat (non-embossed), flexible metal, licensed, purchased several years ago. Please click on the image to see larger picture. Harley-Davidson novelty license plate, 12" by 6", flat (non-embossed), flexible metal, licensed, purchased several years ago (these have a couple tiny scratches). Please click on the image to see larger picture. NOS 1962 motorcycle sticker for use with your vintage yellow California motorcycle license plate for the Year of Manufacture Program (YOM). These motorcycle stickers are smaller than the automobile stickers, so it will look much better on your motorcycle plate. You will receive a NOS sticker just like the one pictured, but it will have a different serial number. We have temporarily blurred some of the numbers on the picture to prevent unauthorized copying of the image. The actual sticker still has a complete serial number (5-8 numbers). 1950 California motorcycle tab, for use with your base 1947 California motorcycle license plate for the Year of Manufacture Program (YOM). There are some blemishes and scratches, and what appears to be bolt marks, though this tab does come with the original cardboard insert and mailer. Old Arkansas motorcycle license plate, with a slight twist in the steel. This would be great for a collector, but is not eligible for vehicle registration. Please click on the image to see larger picture: There are some scratches, areas where the red paint has worn off, and a spot of red in the upper right corner. These motorcycle plates measure 7" by 4". Old NOS Arkansas motorcycle license plate from the 1970's-1980's (steel version). Please click on the image to see a larger picture. This expired plate would be great for a collector, but is not eligible for vehicle registration. This motorcycle plate measures approximately 7" by 4". Vintage California Fish and Game license plates, NOS, that would be great for collectors! These plates measure 8-3/4" by 3". We believe these were made of nickel and issued during the 1940's or 1950's. These also come with 6 bolts. 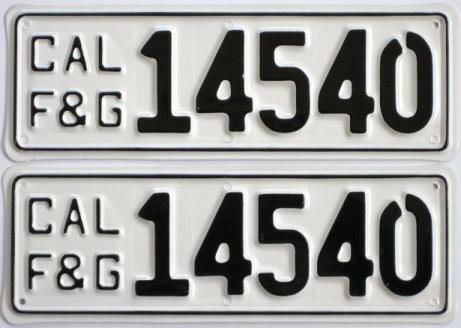 On the top plate, there are a couple of tiny spots of missing black paint on the first 4. Old Idaho boat trailer plate. This would be great for a collector. Please click on the image to see a larger picture, as there are bolt marks and scattered scratches. This measures about 7" by 4". 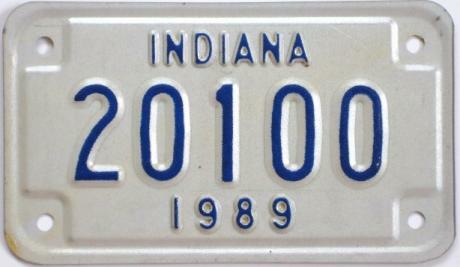 Here is a very nice, New Old Stock, 1989 Indiana motorcycle license plate. This would be great for a collector, but is not eligible for vehicle registration. Please click on the image to see larger picture: there is a small area of yellow on the bottom left corner, a light scratch above the 00, and some scattered small dark spots. These motorcycle plates measure 7" by 4". 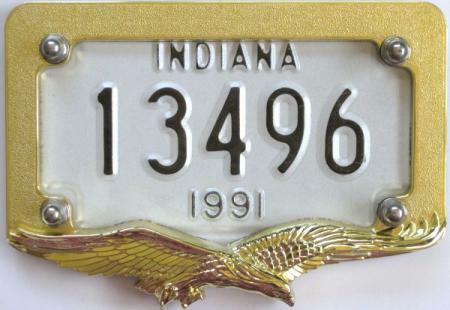 Here is a very nice, New Old Stock, 1990 Indiana motorcycle license plate. This would be great for a collector, but is not eligible for vehicle registration. Please click on the image to see larger picture: there are some scattered small dark spots. These motorcycle plates measure 7" by 4". 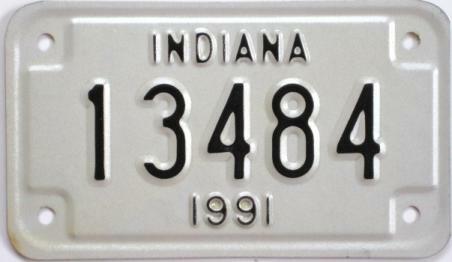 Here is a very nice, New Old Stock, 1991 Indiana motorcycle license plate. This would be great for a collector, but is not eligible for vehicle registration. Please click on the image to see larger picture: there is a small area of yellow on the bottom left corner. These motorcycle plates measure 7" by 4". 1974 - 1975 Minnesota motorcycle license plate, still in the original plastic mailer bag. This would be great for a collector. Please click on the image to see a larger picture. There is a slight twist in the metal. This measures about 7" by 4". New Old Stock, older Nebraska motorcycle license plate. This would be great for a collector. Please click on the image to see a larger picture, as there is a light twist in the metal, and some extra blue in the lower right corner. This measures about 7" by 4". New Old Stock, 1995 Nebraska trailer license plate. This would be great for a collector. Please click on the image to see larger picture: there is a small dark spot in the bottom left corner. This measures about 9-1/4" by 3-1/4". 1997 Nebraska trailer license plate. This would be great for a collector. Please click on the image to see a larger picture: there appears to be very light bolt marks, and some scratches in the black paint. This measures about 9-1/4" by 3-1/4". 1989 South Carolina motorcycle license plate. This would be great for a collector. Please click on the image to see a larger picture, as there are some rough edges and a slight twist in the metal. This measures about 7" by 4". 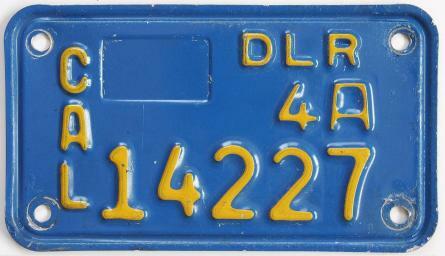 Used New York Motorcycle License Plate from 1978, size is 7" by 4". ***PLEASE CLICK TO SEE LARGER PHOTOS as there are some shallow bends in the metal, bolt marks, and scratches. Old Northwest Territories sample motorcycle license plate, with some scratches and bolt marks. Please click on the image to see a bigger picture. This plate is approximately 7" by 4". Shipping is to USA addresses only. Nunavut sample motorcycle license plate, with some scratches (mostly along the blue border). Please click on the image to see a bigger picture. This plate is approximately 7" by 4". Shipping is to USA addresses only. This is a New Old Stock 1960 motorcycle sticker for use with your vintage yellow California motorcycle license plate for the Year of Manufacture Program (YOM). Please click on image to see a larger picture. There are some scattered small dents in this sticker - please let us know if you would like additional pictures of these areas. We have temporarily blurred some of the numbers on the picture to prevent unauthorized copying of the image. The actual sticker still has a complete serial number (5-8 numbers). This sticker will be mailed in a priority mail box with bubble-wrap for secure shipping. 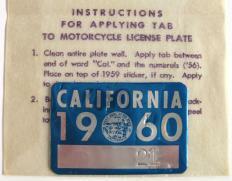 Used California motorcycle license plate, black and yellow, 1963 base, that would be great for a collector! This might be eligible for the YOM program, but it does not have the 63 stamped into the sticker well, and these 6-number configurations can sometimes be hard to clear (please confirm with the dmv if you are interested in the year of manufacture program). ***Please click on image to see a larger photo, as there are some rusty areas, missing paint, and scratches. 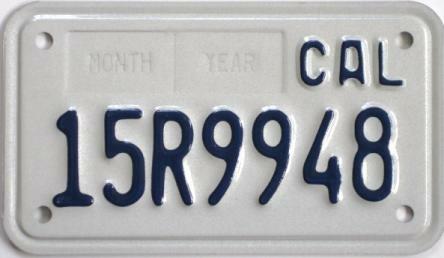 Here is a nice California motorcycle license plate, that may be eligible for the California Year of Manufacture Program (YOM). This plate has some shallow dents, scattered scratches, and what appears to be some small touch-ups to the black paint. Please let us know if you would like additional photos. We have temporarily blurred some of the numbers on the picture to prevent unauthorized copying of the image. The actual sticker still has a complete serial number (5-8 numbers). These motorcycle plates measure 8" by 5". California motorcycle dealer license plate, mid-1970's, aluminum, 4" by 7". This would be good for a collector, but is not eligible for vehicle registration. Please click on the image to see larger pictures: this plate is fairly rough with bolt marks, missing/blistered paint, and scratches. It appears the aluminum under the paint has oxidized and/or corroded in some areas. New Old Stock, Public Service, California motorcycle license plate, from the 1980's. This would be great for a collector, but is not eligible for vehicle registration. Please click on the image to see larger picture: from the manufacturing process, there is a paint blemish in the upper right corner. These motorcycle plates measure 7" by 4". 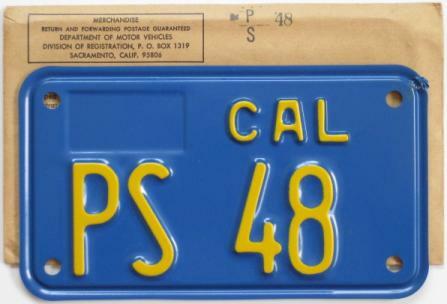 Old California motorcycle license plate, NOS. This expired blue plate would be great for a collector, but is not eligible for vehicle registration. Please click on the image to see larger picture. These motorcycle plates measure 7" by 4". 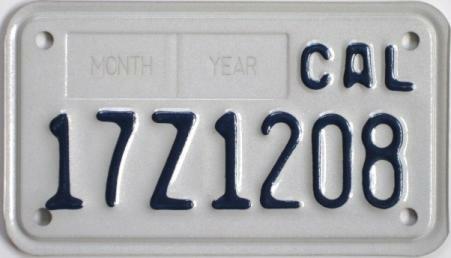 Here is a mint condition, New Old Stock, California motorcycle license plate. This would be great for a collector, but is not eligible for vehicle registration. Please click on the image to see larger picture. These motorcycle plates measure 7" by 4".